Teaching Advertising Part 4: Infomercials! This is part 4 of my Teaching for Advertising thread. To view previous posts click here: Part 1, Part 2, and Part 3. Infomercials are AMAZING for teaching the visual and verbal language of advertising. They're over the top, repetitive (repetition, rule of 3!) and easy to understand. I like to use infomercials to teach advertising to lower English language learners because there are lots of visual aids but the higher level students can also be challenged. Especially when you create infomercials in class. "1. Set forth the problem. 3. Demonstrate how your product or service provides the solution." Make sure you give it a read and come up with some comprehension questions for class discussion or end of class (cloze) reflection. After reading and discussing the article, watch an infomercial in class and have students identify whether the infomercial follows the 3 stages mentioned. It usually does. Next, we watched some infomercials. There are some included already in the PPT of the first post of this thread. My favorite for a couple years now has been 'Jiffy Fries'. Food is always a winner and if you're teaching the concepts of Pathos, Ethos and Logos - this commercial can cover all three! What are the colors used repetitively in this advert? Why do we think these colors are used? What words are repeated throughout the commercial? Why do we think these words are important to hear again and again? What about the product name itself - what does 'Jiffy' mean? What symbols are used in the infomercial? Why are they being used? What does the black and white filter indicate? Why does the commercial go from black and white to color? What does this symbolize? There's a large 'X' that is shown when the commercial starts talking about deep frying fries with oil. And the commercial is black and white, showing someone cooking fries with oil. As soon as jiffy fries are introduced, the screen is in color. Discuss with students the meaning behind the 'X' symbol and color change. - Also relates to Mike Consol's article about introducing a Problem, then Solution...etc. There are so many things to discuss about the advert and I didn't really get to the language features - but they occur as well. Alliteration, rule of 3, onomatopoeia, repetition, colloquialism, imperative...etc. You can make this discussion more of an activity by writing up some of these questions on the board and ask students to take notes, attempting to answer these questions and sharing as a class. I found that the students were able to observe so much as we had already studied visual and verbal language features prior. These all have the great problem, solution, demonstration aspects that the article relates too. And they all have a variety of verbal and visual features. They are great to study. If you have the opportunity to get laptops in the classroom, I recommend asking students in groups to watch one infomercial together and present their findings to the class or in a short essay format to submit to you. I would write up something like that for a double period or spread it over a few classes in a week if you'd like them to submit the written script as well. Here's a cool info-graphic on America's top infomercial products: Click here to enlarge. This is part 3 of my Teaching Advertising Posts, click here for part 1 and here for part 2. 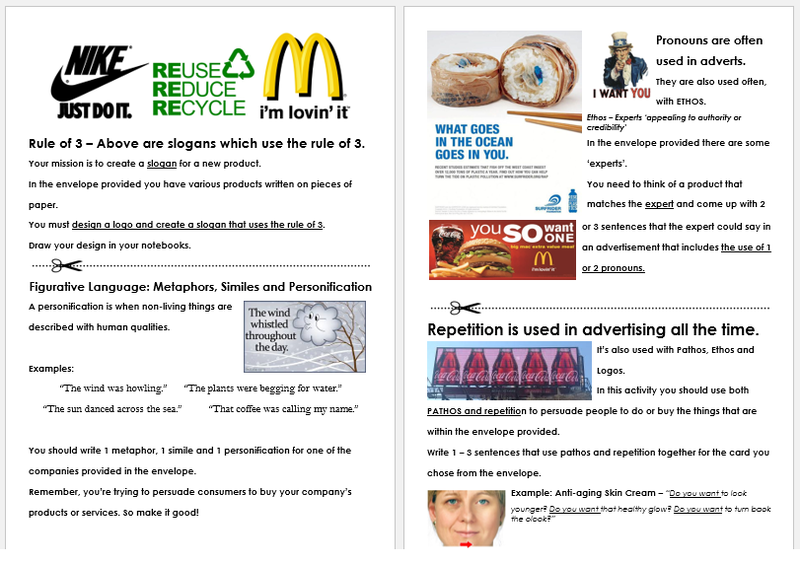 So, after you have covered some language features and visual features of print and video advertising as discussed in previous posts, it's good to start creating adverts so that students can get into their own ideas of what makes an effective advert. I also found this scene from 'Sweet November' - it's definitely more mature as there are sexual references, save it for your senior classes. But I like how they show more of how presentations are conducted with visuals, etc. Watch every video before you play it - a rule. I would stop this one at 2 minutes. 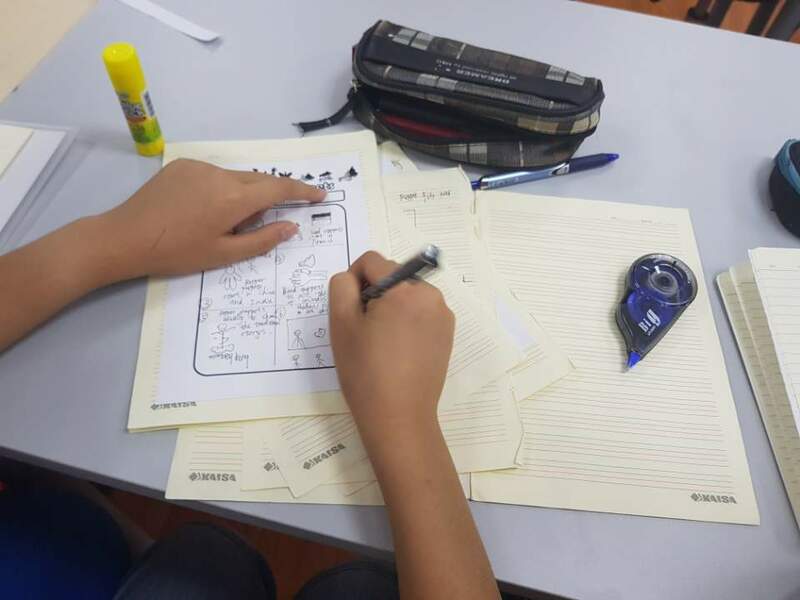 A hit lesson was when I did rotational group work with my grade 12. I got some paper lunch bags, numbered them for easy rotational organization (lol) and within each bag were two envelopes. The first envelope had inside it, instructions for an advert that they had to create as a group. These instructions included the use of a language feature(s) commonly used in advertising. In the second envelope there was a bunch of cards with random products or services written on them. They had to dip their hand in the envelope without looking and choose 1 card which would be the product or service they had to advertise. This was great to keep group work different from others, and it added some fun as they had to stick to what they drew from the envelope no matter how challenging. 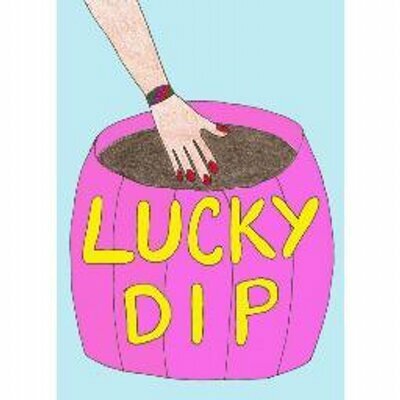 And if you didn't know already - students love lucky dips. Thus, I gave about 10- 15 mins for each rotation and every group completed 4 separate adverts by the end of class. I didn't want them to focus too much on art work, the writing was the most important. Ok, so here is the preview of the activities - but you can download the editable word document for FREE from my TeachersPayTeachers store. The instructions give a brief review of the language feature with examples so that students understand the feature they're being asked to implement. You'll need 4 sets of the cards for each activity, but I thought, why don't I be kind and do that for you, so download these sets here: Click! Just cut them out and put them in the appropriate envelopes. I really hope this group work inspires you in your class. The students really enjoyed working together and the following lesson was spent presenting their group adverts to the class. 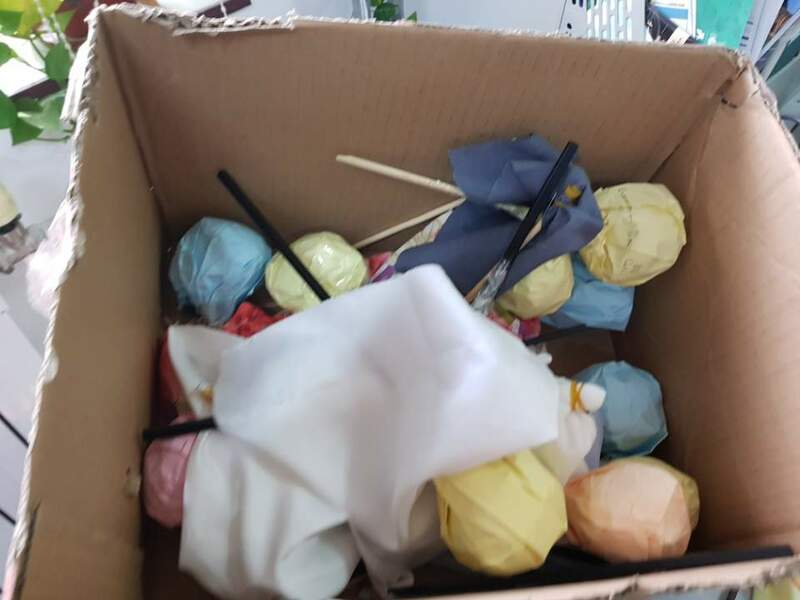 I marked them beforehand and gave out awards (candy) for the best advert per category - categories correspond to the instructions cards ( Rule Of 3, Figurative Language, Pronouns and Repetition). If you haven't already read my last post, click here. This is post 2 of the advertising unit which focuses on symbols and colors - two very important visual language features of advertising. 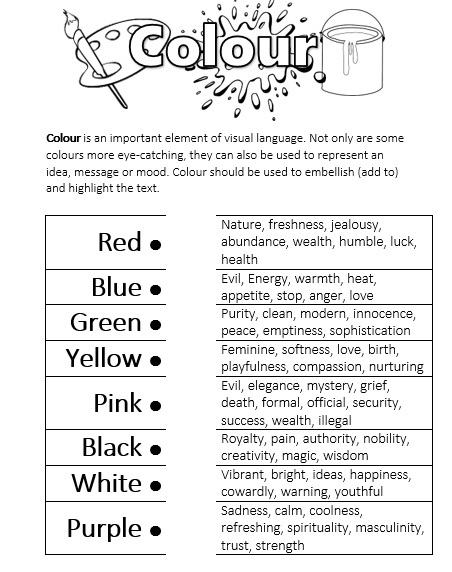 I suggest that if you are teaching visual text as part of New Zealand's NCEA course, you embed these activities to help stress the importance of color and symbols in visual design. For more on visual text specifically click to my previous post where I taught Static Image in The Cook Islands. 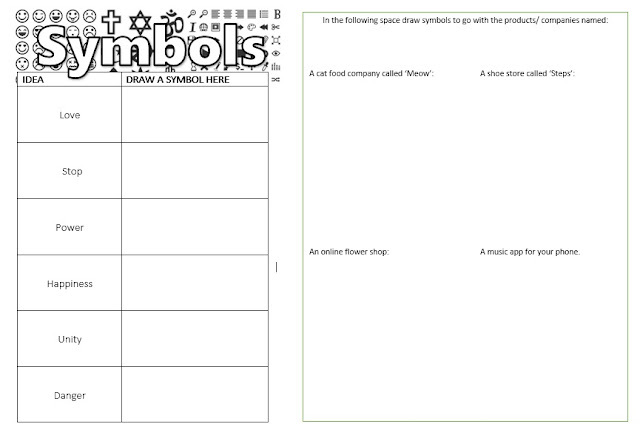 You can download all the color and symbol worksheets mentioned here, for FREE! 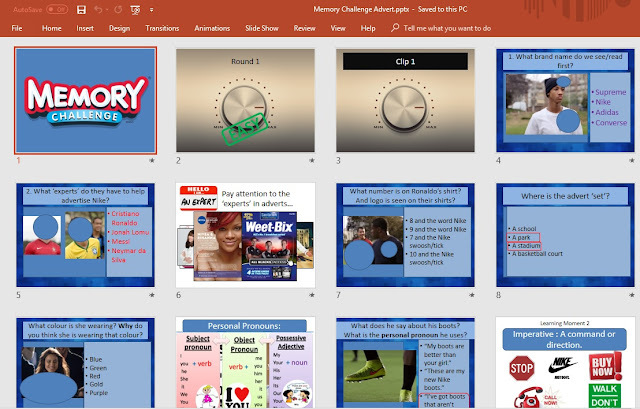 Now, the Memory Challenge PPT from the last post has a slide which asks students to remember what color the woman in the advert: "Nike - Risk Everything" is wearing - the woman who seductively blows a kiss to football player Ronaldo....can you guess the color? Seductive woman, blowing a kiss - what color comes to mind even when you haven't seen the advert? when associated to those words is RED. 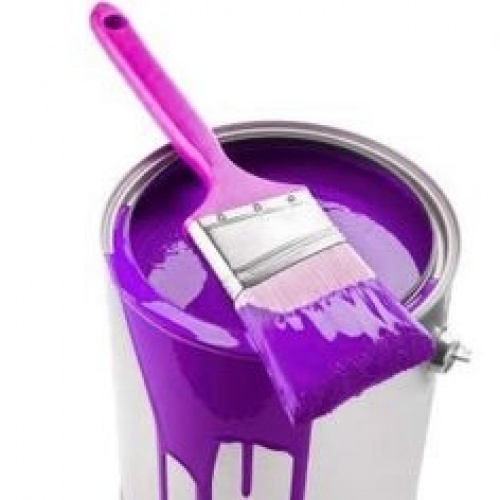 The color purple is often associated to wealth, royalty and even nobility. Why? Because, back in the day - historically, purple fabric was very expensive to produce. Thus, only the very wealthy could afford to buy and wear it. The wealthy as we know were usually the royals or nobles in society. Purple was associated to God and spirituality also, due to the fact that royals were seen as ordained by God / were gods themselves. You can read a lot more at Live Science.com . 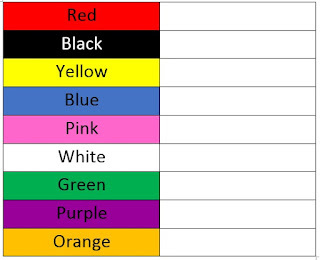 I suggest, if you have the time - assign a color to each student or pair and have them do a little research presentation about what they can find about their color's meanings and history behind them. However, before you give too many facts or assign a research task - do this color activity BEFORE to see what students already think and feel about color meanings and associations. This is also a great literacy activity as it employs prior knowledge, encourages students to use as much vocabulary as possible and applies critical thinking skills by asking students to think about why colors are associated to certain thoughts, things and words. Remember to have students work alone, then share as a class. Encourage individual work before you start sharing altogether. This is also a chance to discuss how colors have different meanings to different cultures. You can direct this discussion further into demographics and target audiences. For example, as I taught this unit in China the color red is associated to luck and wealth. Luck is often a color associated to green in western cultures due to the Irish four-leaf clover symbol. 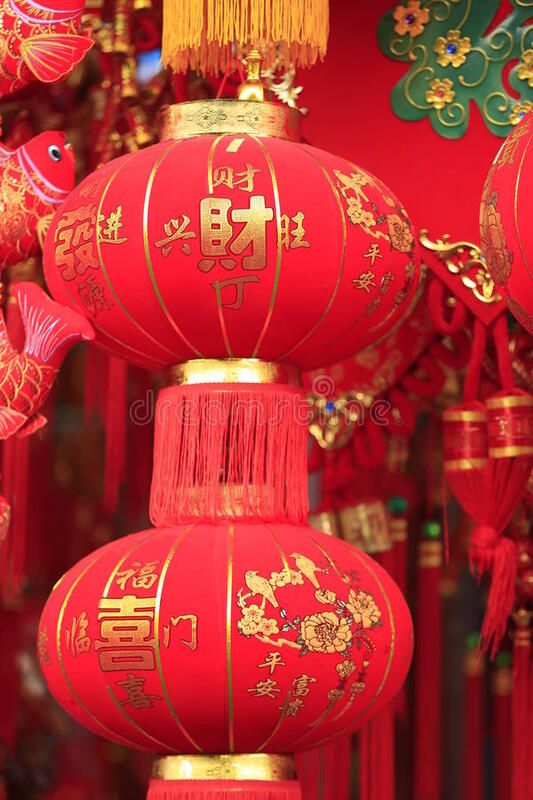 Thus, advertising campaigns for lottery or winning money in China might feature the color red while western adverts of the same kind may feature more green. Now, if you have very low learners vocabulary wise, or less natural ability to brainstorm...etc. You can use my color worksheet that is a mix and match activity with color meaning vocabulary already on the sheet but they have to match the color to the groups of words. After discussing color, I had my grade 12 students read about Color Psychology from this website: digitalsynopsis.com It's good to project it on the board if you can't print it in color. I also did a group activity. I separated students into small groups and assigned them a part of the reading. They had to read it amongst themselves and then come up with 4 questions about the reading. After, we rotated reading section and questions to a new group so that students had to answer questions from another group. This was a nice cloze activity to have students thinking about what they read in class and formulating questions about what they learnt. Again, I had students work on this individually before we shared as a class. This was a great one to see up on the board with students volunteering to come and draw what symbols they thought of. It was a great way to see what was common in our minds and further discuss the power of symbols. The second part of the worksheet on the right side was a way to tie it back to advertising. You can have them complete that part as homework or in pairs/groups to further facilitate discussion. Online Safety Awareness Advert: features a man who looks like a smiley face emoji - great discussion piece about emoji's and the anonymity of online chat. "Who's really chatting online with your child?" For further reading on symbols in advertising there is an article on Adage.com called: Cultural Symbols in Advertising. Thanks for reading. 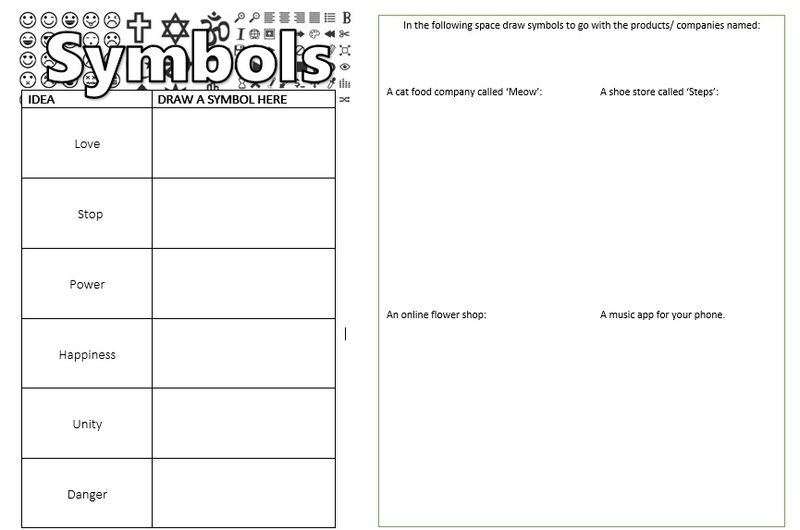 You can download all the color and symbol worksheets mentioned here, for FREE! This past semester in China I was given two grade 12 classes that were unexpectedly low in their English reading, writing and speaking abilities. Thus, after the first few classes of ice-breakers and speaking to their teachers from the semester prior, I knew I had to change my entire semester plan and approach. These were not native level English speakers or even fluent - but in fact, a grade of low to intermediate (at best) ESL speakers. So, with their low level in mind I decided to begin the semester with a unit on advertising. Advertising allows students to learn about persuasive writing via language features as well as the analysis of visual language e.g. symbols, colors and lettering, etc. 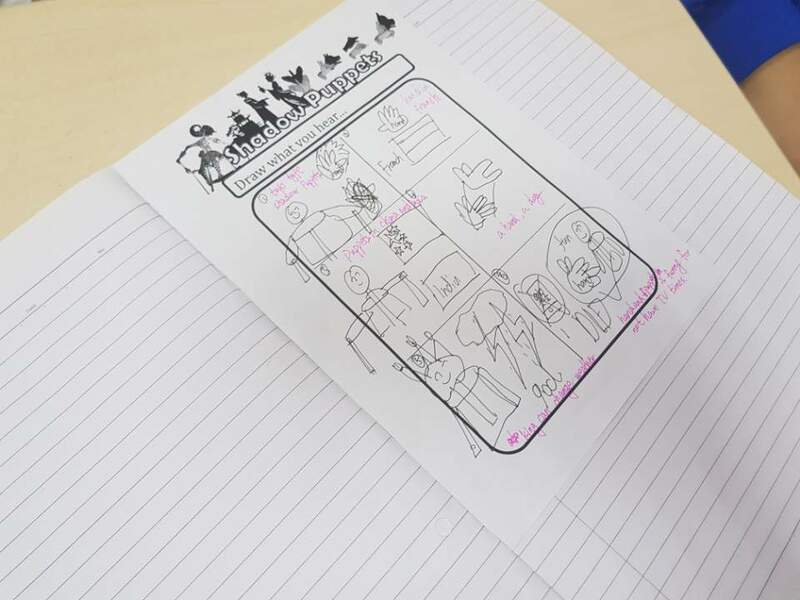 It's also a fun way to engage students at the start of your course and it's hugely creative as there are many opportunities for students to write and design their own adverts. 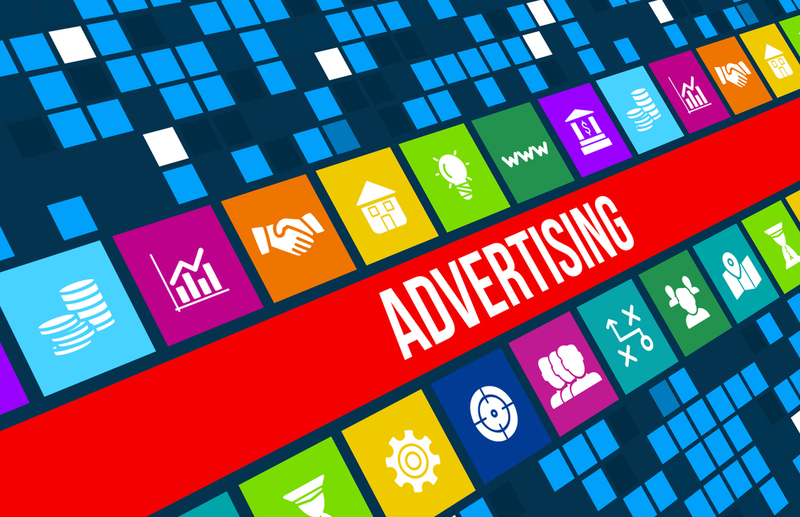 It is also relevant to students as we are surrounded by advertisements and you are able to tailor the advertisements to the interests of your students. In order to aim for high level concepts while teaching low level learners I chose to tackle 'Pathos, Ethos and Logos' right from the start. 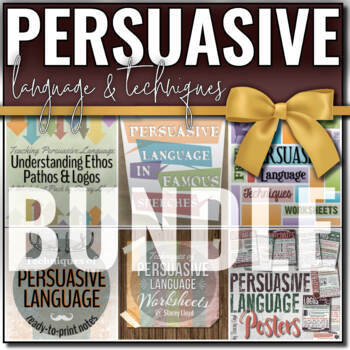 A life saving resource pack was Stacey Lloyd's Persuasive Writing and Language Bundle. It was a great way to organize my unit and allowed for great differentiation for those more capable students. I urge any English teacher / department to have this bundle on hand. It comes with worksheets, posters and accurate handouts about the concepts mentioned. Wonderfully made resource. We started with television commercials. I tried to go through the unit by showing adverts and then picking them apart. I used a memory challenge PowerPoint to help students stay on task and it was less of a game, but more of a great way to facilitate discussion. Students enjoyed the memory quiz while I was able to steer the class into different persuasive aspects of commercials. You can download the PPT for FREE from my teacherspayteachers store by clicking here. There are links to the adverts being discussed within the powerpoint. The PPT is designed so that you have lots of opportunities to discuss different aspects of advertising. I used it as my skeleton and then I would stop the lesson to introduce supplementary materials and activities based on what we were discussing via the powerpoint. Repetition of logo or brand name - also, the rule of 3. Discussion of repetition and why it's important in advertising. 'Experts' - the first discussion of Ethos concepts. Discuss why certain celebrities or professionals are being used to advertise certain products. There's a good Ethos worksheet in the bundle to cover this further. Color - the woman in the Nike advert is wearing red. A discussion of color and meanings. Personal pronouns in adverts - 'you', 'my', 'I' - discuss directly talking to audience/potential customers. Testimonials and reviews. Above are only discussion points for the first slides - you can see how this can be stretched out to cover weeks of learning. Make sure to download and have a play around to see where you would start. I will be adding more teaching advertising posts with more resources and activities. Keep following! 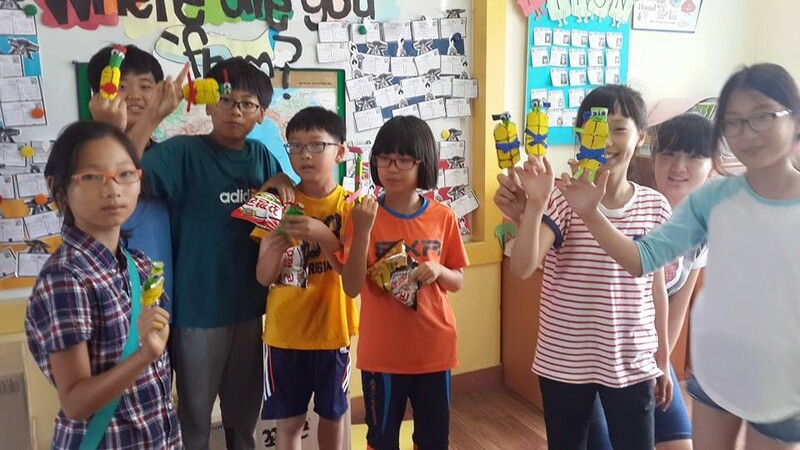 Last lesson, we made rod puppets . For our last class, we reviewed what will be on the final exam and then we finished making shadow puppets. Before we made our puppets we discussed the different types of shadow puppets - Hand shadow vs Paper shadow puppets. We did a picture dictation exercise where I said one sentence to the students and then they had to draw what they heard. It's a literacy exercise that you can read more about here. 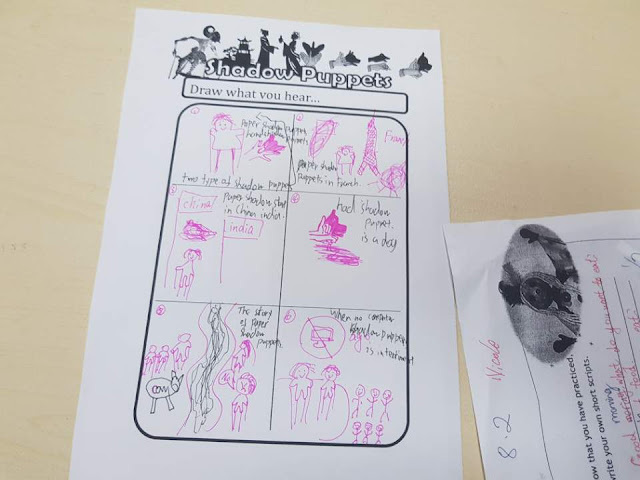 My picture dictation was a hit, and students were able to use their drawings after to try and remember the sentences I had said - in turn, they learnt key facts about shadow puppetry. We also watched some videos of hand and shadow puppetry in the lesson prior. 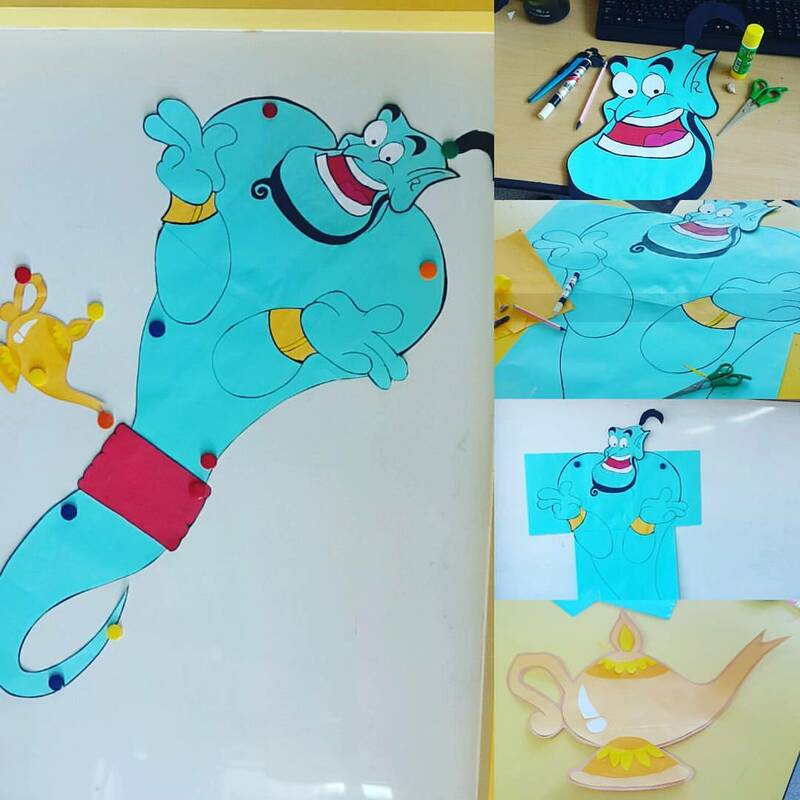 If you have a projector you can project a white slide of a PPT and let students have a go making hand puppet shapes. Or, just grab a torch or the torch on your mobile phone. For those of you with the time, I highly recommend extending a shadow puppet unit to a performance. We performed with rod puppets but didn't have time to do much but experiment with shadow puppets. There are lots of cool shadow puppet theatre links online with instructions on how to make the stage for a performance. 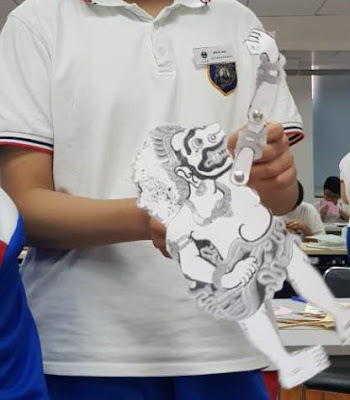 I got my templates for free from Education Asian Art.org -the site is so helpful. They offer puppet templates as well as some lesson planning ideas and history of shadow puppetry. 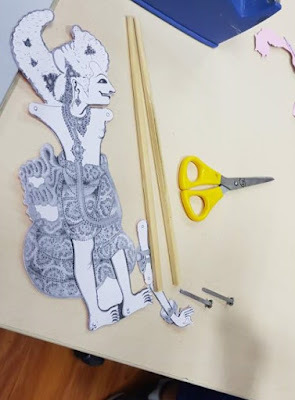 The templates from their site are Indian puppets. After downloading and printing the templates in black and white, I got some split pins and chopsticks (you can use wooden dowels instead of chopsticks). 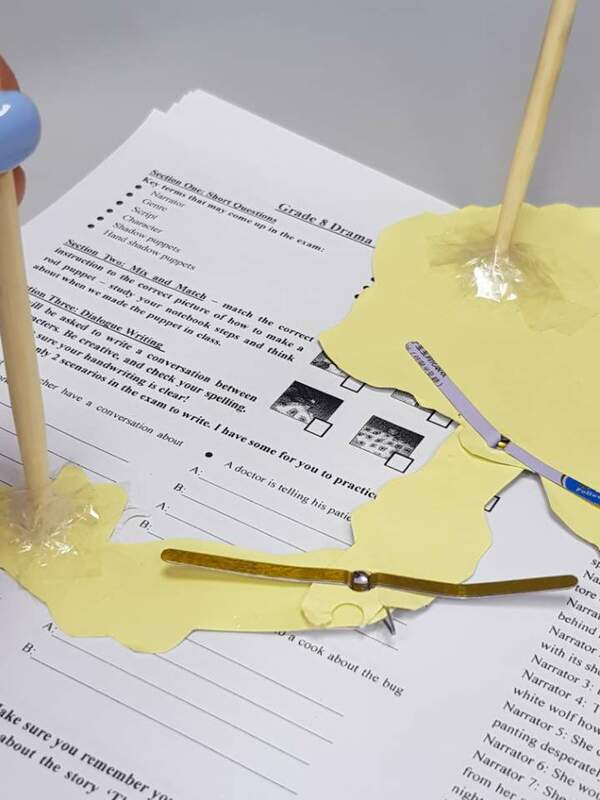 You'll also need scissors, a hole-punch or two and glue. 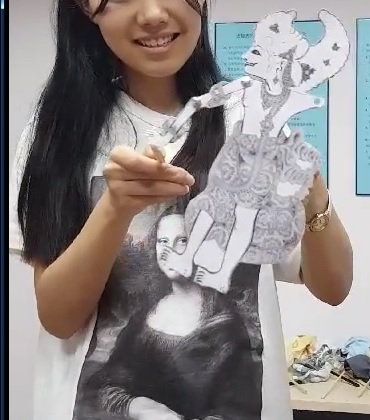 I didn't have any card to print on, so I got students to glue their shadow puppet templates to another piece of paper to thicken them like card. Printing straight on to card would save time. 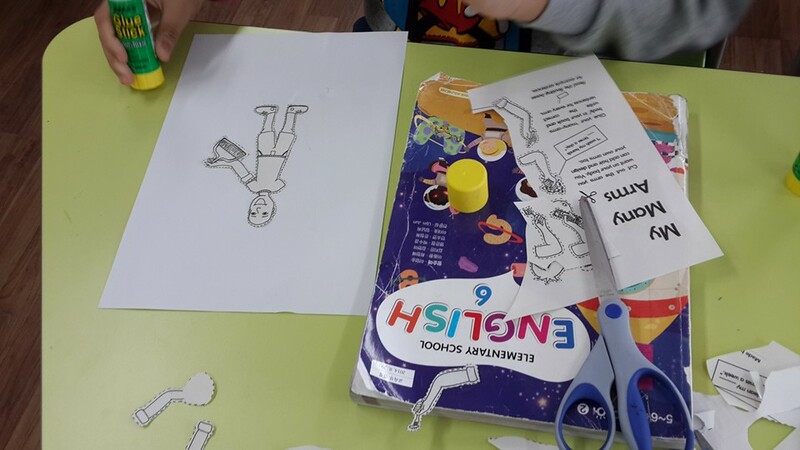 After cutting the puppets out and their limbs, we hole-punched where the circles are drawn on the puppet's body and arm pieces. In these holes, secure the split pins so that the puppet limbs can move easily. Then, at the back of the puppet tape or hot glue gun the chopsticks/dowels. The chopsticks should be placed strategically for puppet movement. 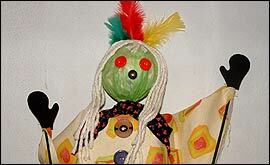 So one chop stick in the centre of the puppet's body or at it's head. The other, on the arm that moves. Below you can see how the chopsticks are secured by using layers of tape. 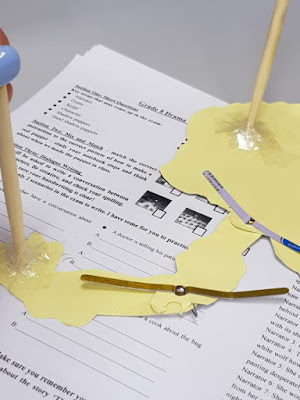 If you have a hot glue gun handy it will be a bit easier and faster - but the students got the hang of the tape method fairly quickly. My split pins were too long, so when you buy them try for a shorter length. 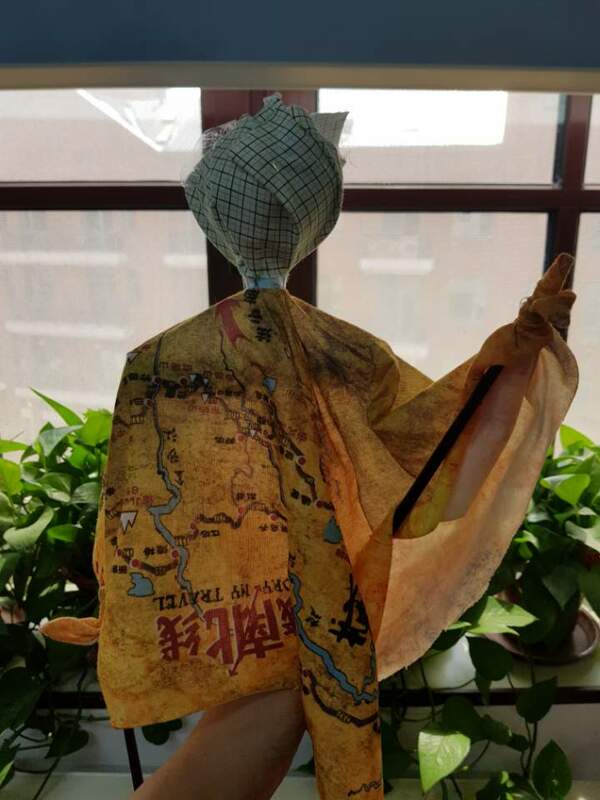 Grade 8 Puppet Unit - Mrs. Baia is in China! 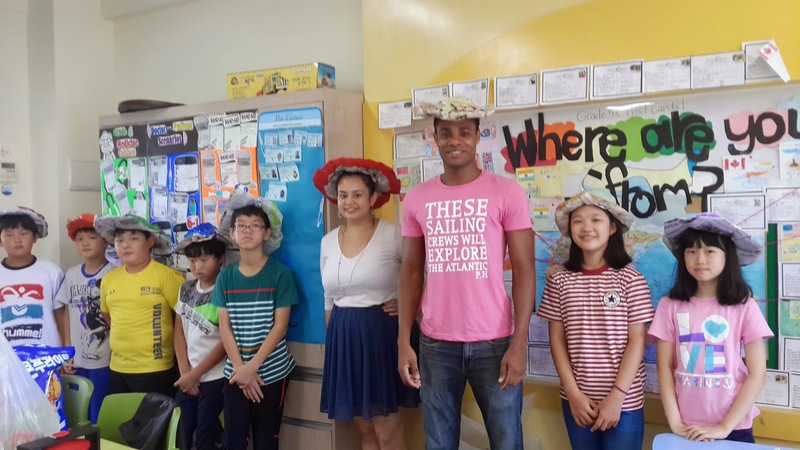 It's been a loooong time since I posted and mostly because I am not teaching ESL anymore, I am currently teaching secondary English literature & drama at an international school in China. Thus, the workload has been heavier and a lot less time to blog. However, I really wanted to share what I have been doing with my grade 8 drama class (the babies of the school). I only see them once a week as drama is an option for them, and they're just having a taste. Thus, for the end of the semester I wanted to do a creative crafty project as we have just finished reader's theatre and mime was before that. So, what better than puppets? Our first lesson we went through the different types of puppets - as they had little knowledge of puppetry and didn't know much beyond TV shows and of course they knew shadow puppets as Chinese traditional puppet shows use shadow puppets. I made a quizlet set for the class in order to do a mix and match activity and quiz - you can check it out here. Quizlet is a godsend for making review quizzes by the way! Plus, lots of other ready made quizlet sets to use for your teaching or studying. 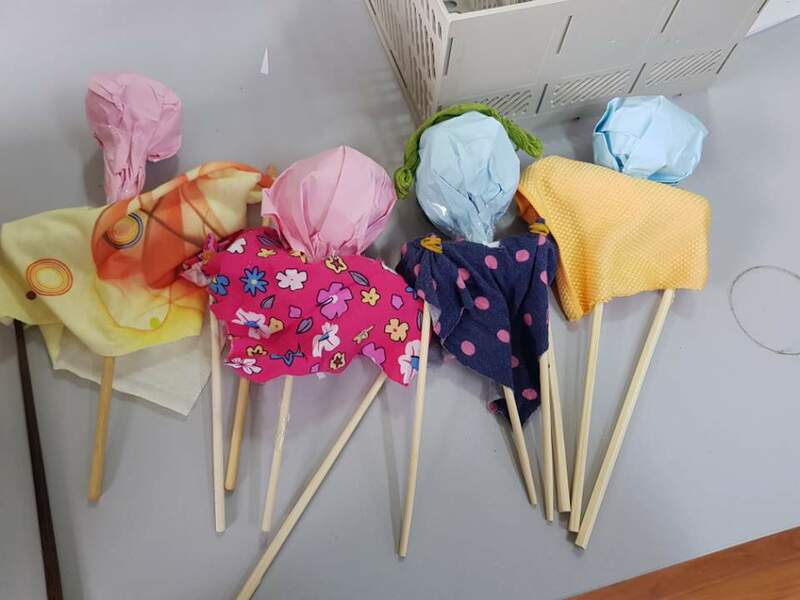 After that introduction, we made rod puppets. I got instructions from BBC Norfolk Kids as this was the easiest puppet I could think of making besides sock or finger puppets. 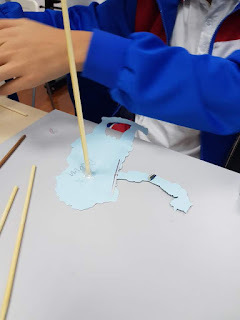 Instead of 'cane sticks' I asked students to bring in 2 sets of chopsticks - these are so easy to find in China, and cheap or even free as they come with any take-out meal. 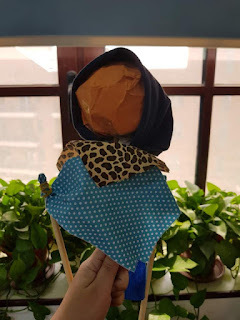 We decided not to decorate to make a face - our puppets are faceless, creepy, yes, but it wasn't needed for the learning side of things. 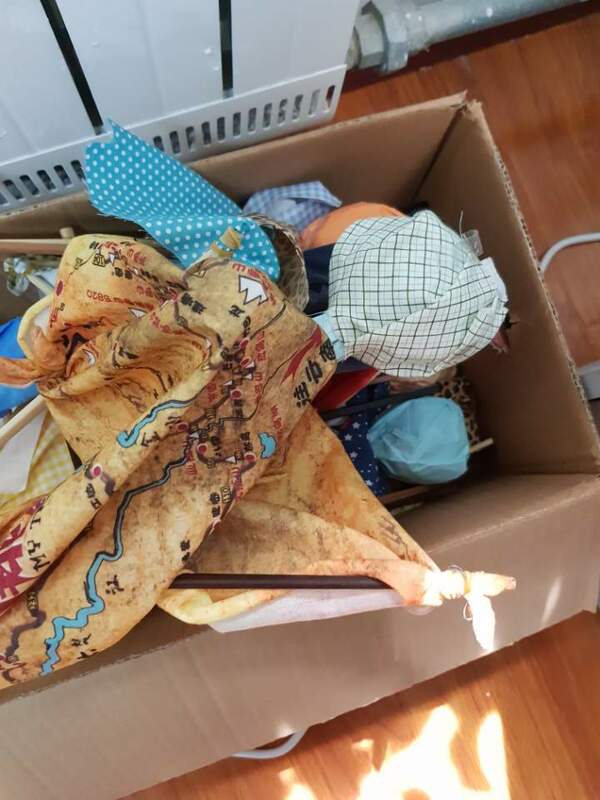 As you can see, the puppets have 2 arms and 1 body - made with the chopsticks. The instructions on the BBC site I linked here are very easy to follow. We did this step by step as a class and I made sure to demonstrate everything as we went along. Now, after finishing the making we are going to do our first puppetry workshop where students will work in pairs and act out short script pieces using their puppets. 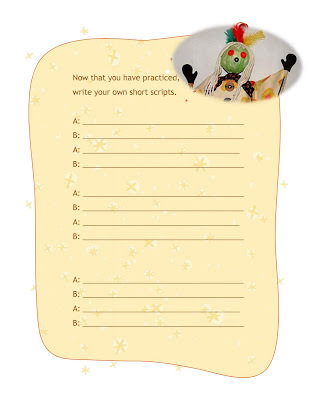 They will also receive a worksheet to write their own mini-scripts with their partners and then we will share with the class, pair by pair. Next week, we will tackle a class play. 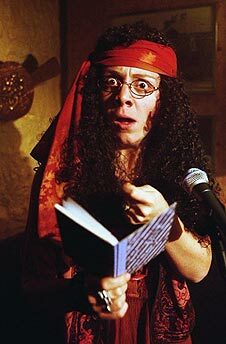 Disclaimer - we studied mime and body language in particular, at the beginning of the term. Thus, I am not going into puppetry body language so much because we will revisit what we learnt as mime artists. If you are doing this lesson for the first time, without a mime background, you may want to spend some lessons looking at gesture and body. 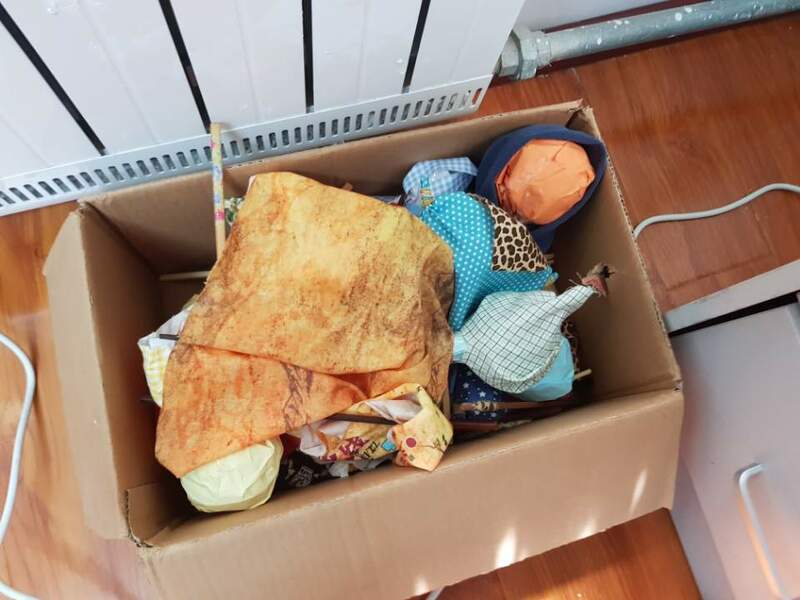 How to make this an English lesson? Simply swap the scripts of my worksheet with the dialogue/phrases and vocab that you've been teaching. It's a cool way to spice up conversation time and you can add this to an English camp easily. I am back at PASS for my third week of volunteering. I have not been teaching but helping to create resources for the school's reading programme that has a lot more pizzaz than most reading programmes. First things first, this is not your average 'SSR' - Sustained, Silent, Reading. At PASS the students have been surveyed and like most teens, especially Pasifika in NZ, reading isn't a craze amongst the students. 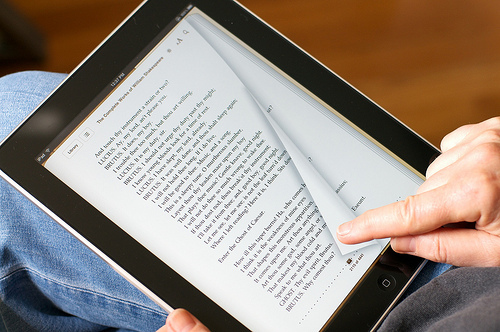 The survey revealed that most students rarely read and don't enjoy reading. So, we needed to put our minds together to create a reading programme that wasn't just opening a book and expecting students to read intently. Instead, there has been a roster of reading activities made so that every fortnight each village (house) will rotate to a new reading style/activity. My mother (H.O.D. 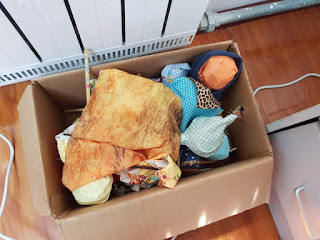 English at PASS) and I worked together with these ideas and I have since been a busy bee creating and sourcing resources as part of my volunteer position. 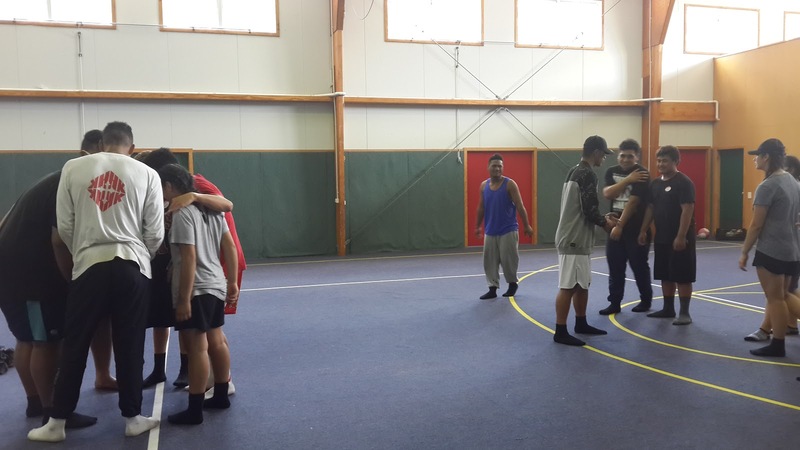 It has been a great experience thus far, working a little in a NZ secondary school! Excited to have a real full time job at one next year after studies! E-book reading - interactive 'flip books' that can be read on a computer as we don't have school wide tablets or kindles. Scavenger Hunt Reading - using a range of Guinness World Record Books from throughout the years. We sourced these fun books from a bunch of different Op shops (thrift/2nd hand stores). Spoken Word Reading - I scoured the internet to find some Spoken Word pieces that were by Pasifika poets! I also included some non-Pacific poets but to have poetry that relates to our Pasifika students is so important! Newspaper & Magazine Articles - These are short articles from online Newspapers and Magazines like Buzzfeed, Girlfriend Magazine and The Guardian to engage students who enjoy reading articles on their phone via Facebook or other social media. But, instead of on a phone they're printed out and some reflection questions accompany them. Audio Books - we are in the process of finding audio books for the students to read, this will be an activity to take place, later in the term. Reading Aloud - a shared reading experience where the teacher will read a short novel or short stories during each reading session to their village (house/form class) and hopefully get really animated. Props and costume pieces are encouraged! So, for only a few of these categories, resources needed to be made. Spoken Word Handout Sample 1 - Grace Taylor "Power Of Words"
Students should read the poem first, discuss as a class and then watch the performance on YouTube. I've made 10 of these fab Spoken Word handouts, some I was lucky to find the poems already written out online but most I had to listen to and type out myself! #work ! Click to enlarge image. 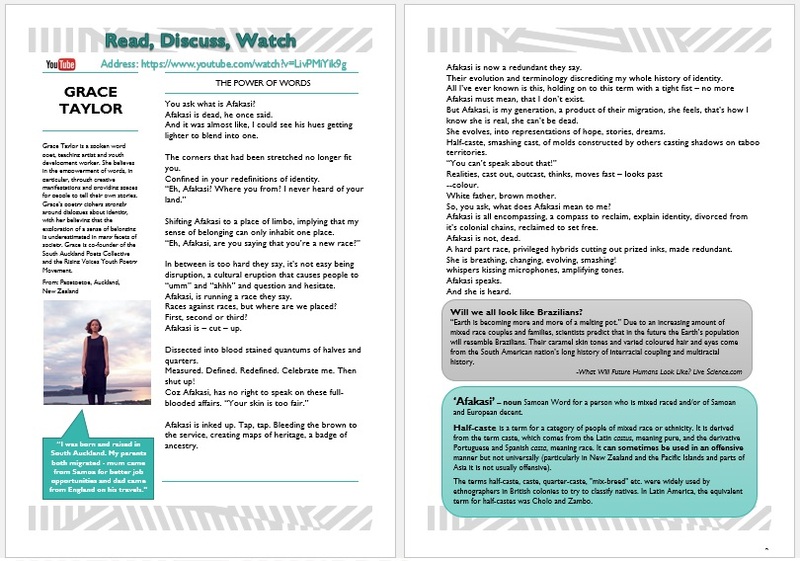 Click here to download my Spoken Word Handout Pack! Since our students love hip hop and rap I thought they'd enjoy this article. Tupac is still very relevant today! I got the article from Mashable which is a great site. And I created the reflection questions myself. Students should be instructed to read, re-read and then discuss with their partner using the reflection questions. 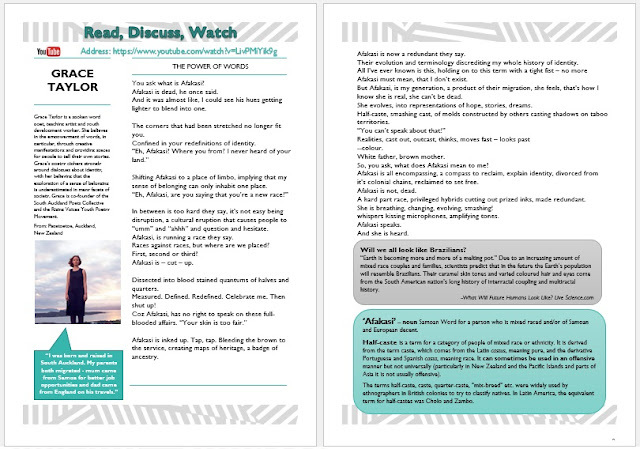 Teachers have the option to give out 2 of the same article in each class so that students can make pairs for discussion. I have made 6 of these already! Click to enlarge! Click here to download my Newspaper/Magazine articles zip file! I made these using a few books to guide me. 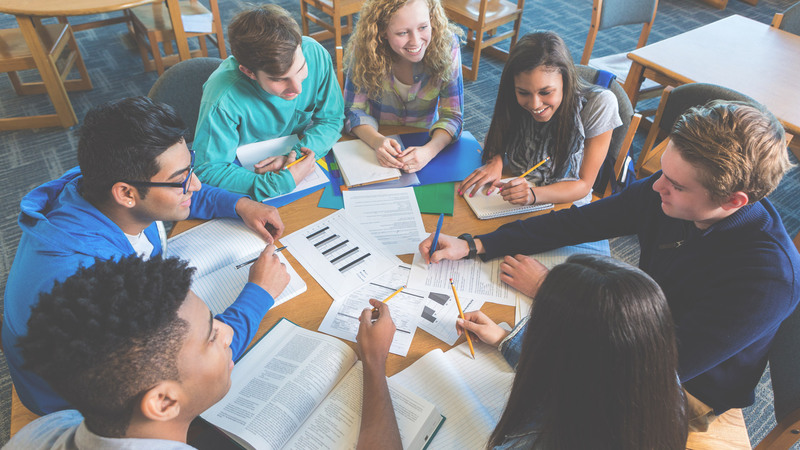 It doesn't matter what year the record book - it matters that students are reading, searching and answering the questions to the best of their ability. This is actually a great activity because it is interactive but also practices student sourcing/researching abilities. 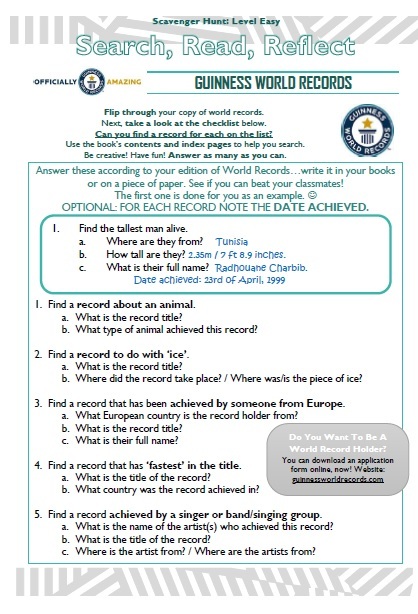 Teachers are able to hand out the same copy for every student and start a class-wide competition - who can complete the Scavenger Hunt first or get the most in the set time. I created a set of 4 levels - Easy, Medium, Hard and Super Hard! I think it is a great way to use the record books and like I mentioned earlier, mum and I found these books in Op shops for cheap from multiple years. It doesn't matter if the record has changed since then, it's the reading that counts. And students LOVE these books, they're so interesting and have lots of pictures. Click to enlarge. Click here to download - Scavenger Hunt docs. I hope this can inspire you for your own school wide or class reading programme! Or you may use these resources and follow our programme and it's ideas! Happy Reading & Happy Teaching! Since coming home I have enrolled in Waikato University for their Graduate Teaching Diploma (in Secondary) and tried my best to get into some more volunteer teaching roles. 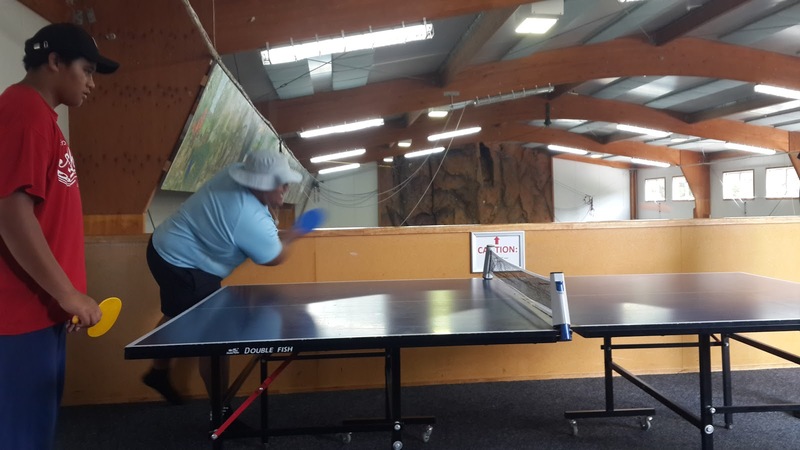 (View my previous posts on Volunteering in the Cook Islands, here). With school only starting a week ago it has only recently become a possibility to take part. 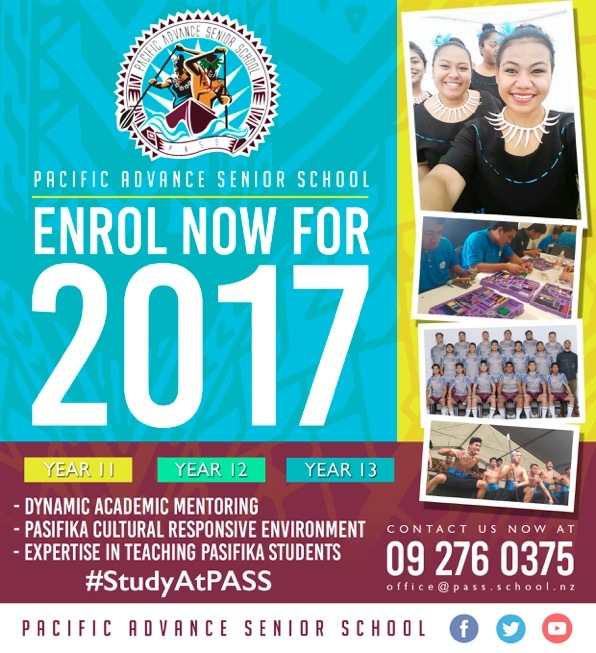 Moreover, I was really lucky to attend the opening ceremony and pōwhiri at PASS - Pacific Advanced Senior School in Otahuhu, last Monday. During the ceremony new and old students were welcomed and an inspiring speech by well known All Black legend Michael Jones boomed in the small school's hall. 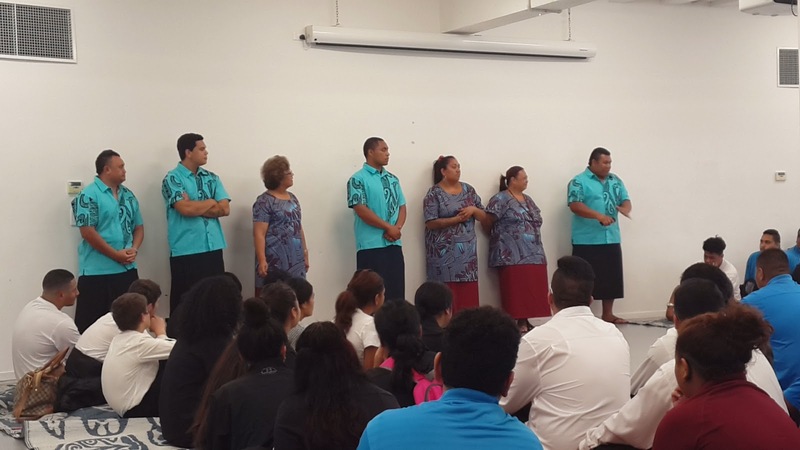 It was a great moment to be apart of, a for Pasifika by Pasifika school - the first of its kind in New Zealand. Very cool, very meaningful. Later that day we headed off to Henderson where the school camp commenced. 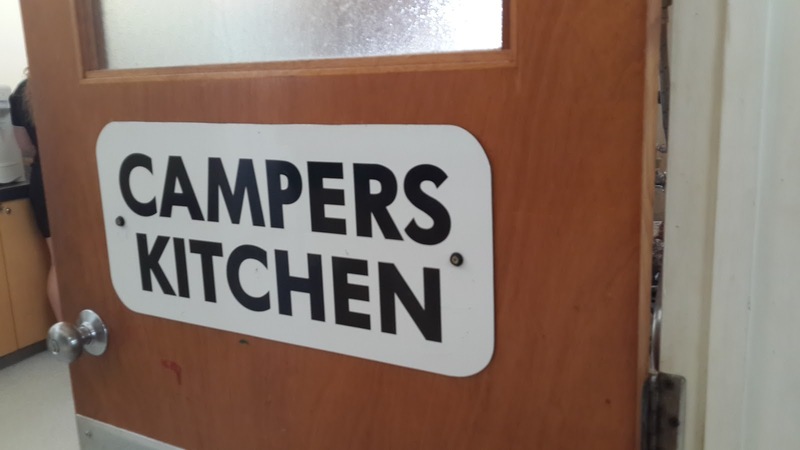 Due to some unfortunate health issues I wasn't able to participate in the entire camp but did help mum run a day of drama games and other activities during camp day 2. 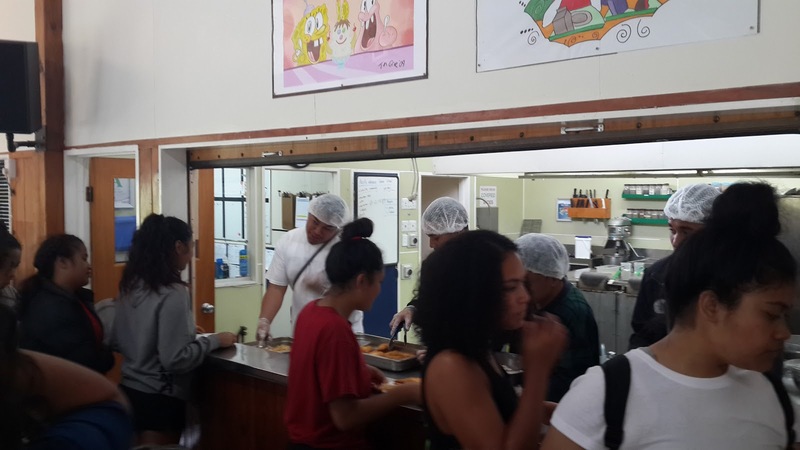 It was a nice experience meeting some of the students of the school and getting a feel of the school's very Pasifika, Christian values and routines. A job I helped with most however was outside of camp. I was asked to revamp and design the 2 front walls of the school lobby/hall as they were needing a little more pizzazz. I could kick myself for not having before photos!!! 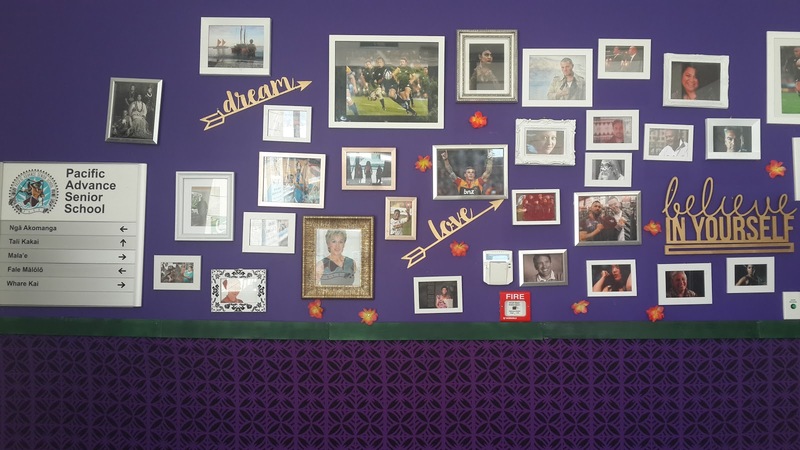 But if you can imagine, they were just purple walls with some photos in frames before and I added the rest - with help from (tall and good for hanging things up high) sister/cousin Chloe and Mum of course. 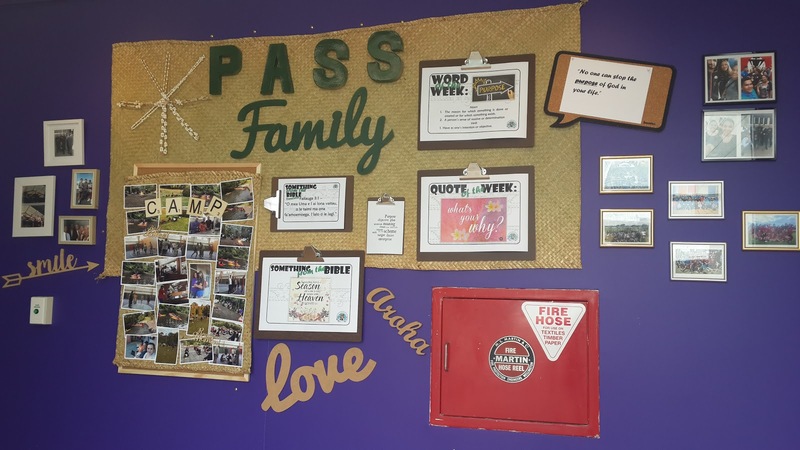 The photos are actually of influential and successful Pasifika People from NZ and around the globe - this was such a cool idea, not mine but from the secretary - I have just spruced it up. Here are our 2 walls! We rearranged all the frames and instead of mixing white and black frames I chose to do an all black frame wall and then the other wall had all the other white and metallic coloured frames. This added instant structure and order. Then I bought some metres of island fabric from one of the many island fabric stores in Otahuhu. $8 a metre from Lucky Star. Then, after nailing the fabric to the wall, we added a wooden boarder which I got from spotlight, they sell wood boards for any sort of craft project, I simply painted them and joined them together to frame the top of the fabric. This fabric boarder instantly added character to the wall and made the frames stand out more as there was less surface area to hang the frames, so the wall didn't swallow the photos up like before. As you can see, we painted and put up some wooden words - inspiring words to relate to the photos of inspiring Pasfika people! We also used a few flower stickers to cover up old nail/hook holes! And for another more functional wall, we did a display of camp photos as well as a bunch of clip boards (I love Warehouse Stationery!) 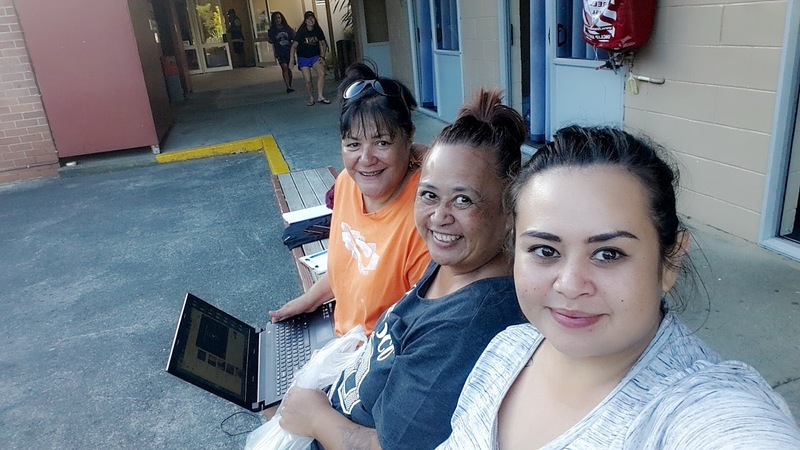 that feature 'Word of the week', 'Quote of the Week', 'Bible Verse' and 'Bible Verse translated to Samoan' - the language of translation will change every month to a different Pasifika (Polynesian) tongue. These clipboards will be changed regularly. I love the idea of the clipboard and quote/word of the week - I hope to one day implement this in my classroom when I am full time teaching again! Feel free to click to enlarge these pictures, to get a better, closer look! If you are about to decorate some of your school walls in NZ, I recommend Spotlight for the wooden words and mats, Warehouse Stationery for the clipboards and more!